Reanimation of the classic Call of Cthulhu campaign. The new edition of Masks of Nyarlathotep is a complete revision and updating of this epic multi-part campaign set in 1925, in which steadfast investigators must unravel secrets and battle the minions of darkness in an attempt to stop world-shattering events from destroying humanity. Get the Omnibus PDF Edition! 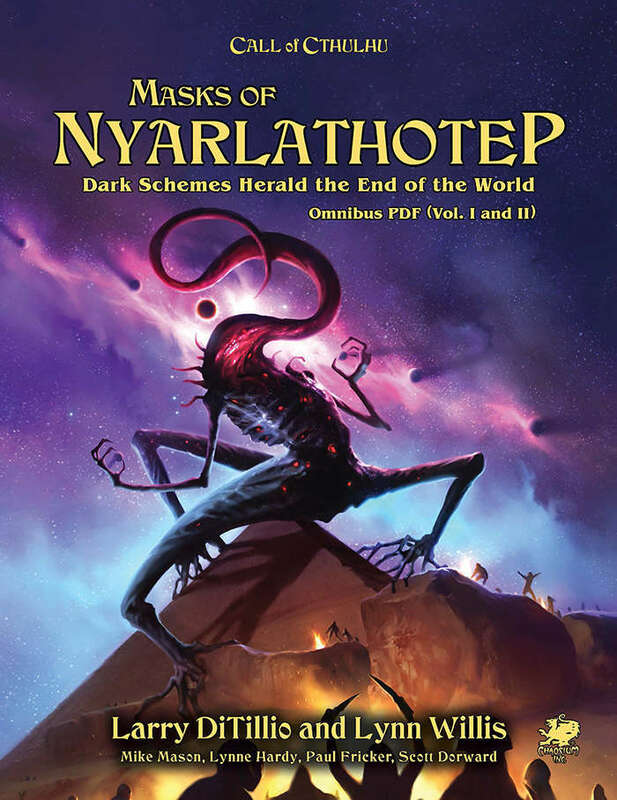 Masks of Nyarlathotep has been comprehensively revised and updated for use with Call of Cthulhu 7th Edition, but may also be run with the Pulp Cthulhu supplement. Global campaign covering seven countries in five continents! Packed with encounters, side-track adventures, detailed adversaries, geographical information, and more! Presented in full color, with new artwork, maps and floor plans, and ready to use player handouts. Appendices collect spells, tomes, artifacts, and travel advice. Ultimate edition, packed full of advice and tips. 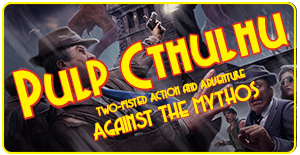 Requires the Call of Cthulhu Keeper’s Rulebook (7th edition) to play, and is optionally usable with Pulp Cthulhu. The original six-chapter campaign featuring adventures in America, England, Egypt, Kenya, Australia, and China have been developed and updated by Mike Mason, Lynne Hardy, Paul Fricker, and Scott Dorward, and feature enhanced and new encounters, sub-plots, and on-point guidance for the Keeper. Now written to be playable with either standard Call of Cthulhu or Pulp Cthulhu, the text guides the Keeper and allows for both gritty or action-packed pulp styles of play. 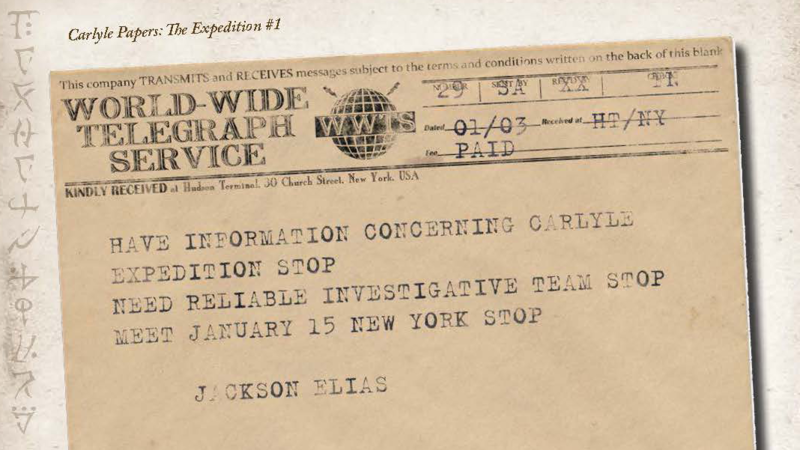 The Introduction chapter features a new foreword by Mask’s creator, Larry DiTillio, and goes on to provide an overview of the campaign, it’s key players and their goals and differing agendas, and the important locations the investigators will travel to while they seek to understand the mystery unfolding before them. Additional material looks at the dark god Nyarlathotep, his cults, and his role in the campaign. Guidance is also provided on running the campaign, including considerations of historical depictions, pulp or standard play styles, and lethality level (just how much danger should the investigators’ face). Rounding things out is plenty of advice on creating investigators for the campaign, replacement characters, and ten ready-to-play investigators for those wishing to dive straight into the adventure. 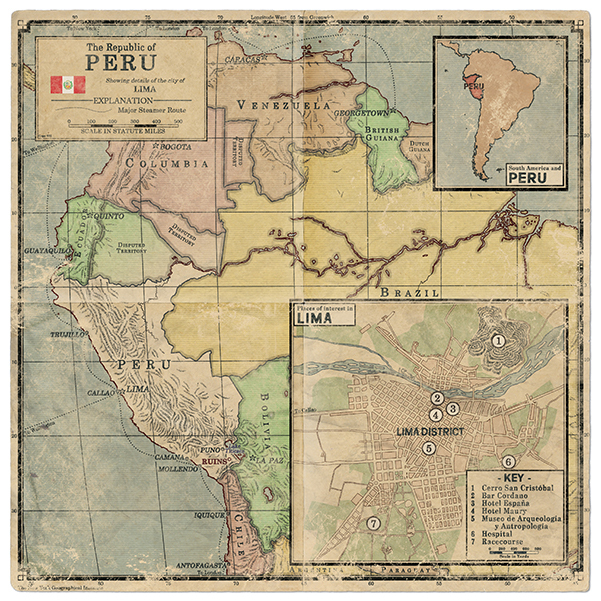 Set in Peru, this new scenario takes place in 1921 and provides an exciting introductory prologue to the campaign, where the investigators meet Jackson Elias, the industrious and charming author, whose researches lead into the globe-spanning mystery. 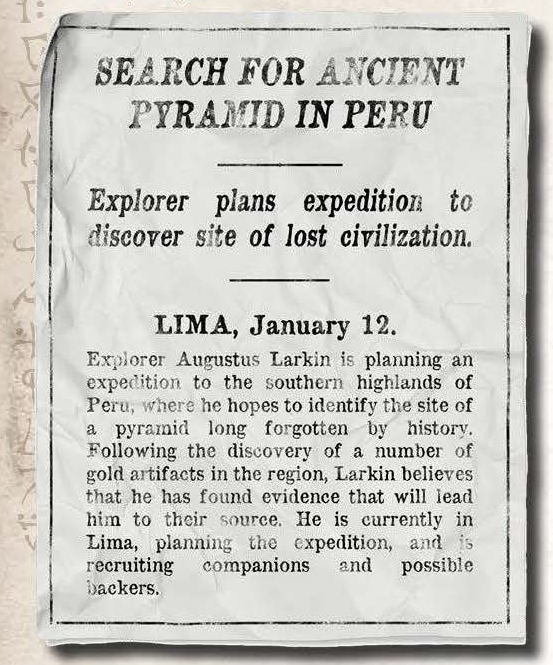 Embarking on an expedition to find a lost South American pyramid, the investigators come face to face with ancient horrors that foreshadow the task ahead. And for an added bonus, a Grand Conclusion chapter helps the Keeper to determine just how successful the players have been in tackling the dark schemes of Nyarlathotep’s cults, as well as discussing ways to extend the campaign in a variety of ways. Each chapter has been tirelessly crossed-referenced to help those running the campaign to keep track of the many locations, characters, player handouts, and items thrown up by the players’ investigation. With new appendices collecting spells, tomes, and artifacts, running the campaign is easiest it has ever been. We have added Detailed New Appendices! Travel – detailing travel times across the world, means of transport, rest and recuperation for traveling investigators, travel events, and also guidance for investigators wishing to learn new skills and improve existing ones. Spells – collects campaign-important spells together for handy reference, with over 30 spells detailed. Including Call the Black Sphinx, the Seal of Nephren-Ka, and the Ward of Anubis, to name but a few. Tomes – during their investigations the investigators may come across a wide range of Mythos tomes, each bulging with forgotten and dark wisdom. 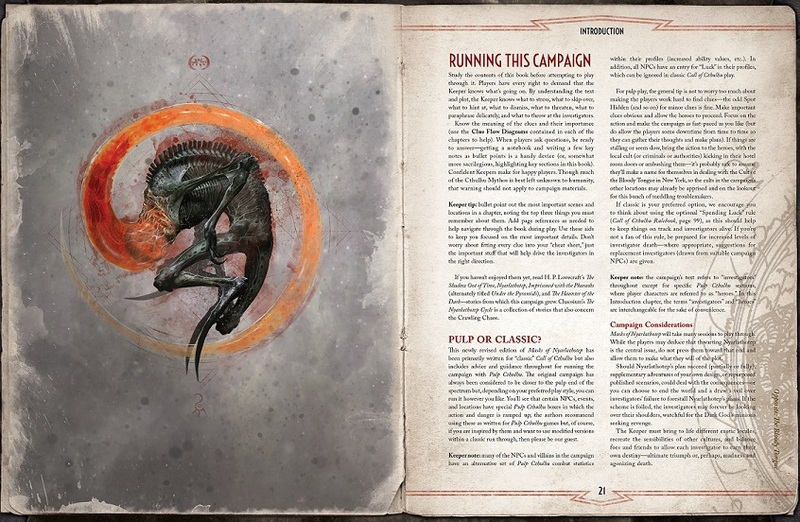 This appendix gathers all of the tomes encountered in the campaign, with over 20 detailed listings, each providing background the tome, the lore within, and relevance to the campaign’s plot, be it the dreaded Necronomicon or the abhorred Black Tome. Artifacts – just as there are numerous tomes to be discovered, there are also plenty of strange artifacts to be found (some useful, some deadly). Here, fifteen artifacts are gathered, from the Mask of Hayama to the Headdress of Eyes, from the Adornments of Nitocris to the very strange Device of Rods, Wheels, and Mirrors. What are you waiting for? Go Save the World! Are there plans to convert this to any other rules sets (such as Savage Worlds). It looks beautiful. Reading well. It is worth the price. However, it has a big downside for me, which I learned after buying. Handouts are not editable. For me, this is a problem, because I play in a different language - I was hoping that before printing I could easily translate them. My preordered physical copy arrived today and it is stunning. So heavy and such excellent quality. Can't understand why people gripe some much about paying $60. You pay $20 to go see a movie that lasts 2 hours or $10 for a pint at a bar. $60 for an amazing adventure that could give hundreds of hours of entertainment seems like a pretty good value to me. So the preview is basically just the table of contents and one full page picture. Christ Almighty! Sixty US Dollars for a PDF with no Bricks & Mortar-style options. Nope on a Rope. Also, the printed hardcover slipcase set goes on sale in a few months. I can’t wait for the slipcase version. I’m assuming it’s going to be about 120 maybe? But I wouldn’t hate the 6 PDFs for 9.99 each. I think the 59.99 all at once is just a bit hard for people for a pdf. I know it’s worth it’s price. It looks amazing and all the 7th ed books have far surpassed all the other editions. If you guys could break it up into chunks that would be awesome. Either way I’m hoping to get This one day. Thanks for such a great book. Sad fact: buying it here does not get you the coupon for reducing the price of the printed slipcase books... I wish Chaosium would change their mind about that. Chaosium does not get much, if any buyer data from DTRPG. Nor do we get specific refund related data if the transaction is reversed. We also do not get the same revenue from the sale. All told, that makes it too difficult to offer coupons for the printed books when the PDFs are sold elsewhere. With respect, you can access partial data on unique sales. There are ways of matching transaction codes with customer accounts and refunding in part or full the 60% royalties earnt on the PDF when you sell a printed copy to a customer, regardless of where else you are printing or selling from. It's awkward but do-able. Disappointment for some here might again be linked to expectations over the price of PDF alone. I like the idea that a PDF can be sold as a sort of "early access" to rulebooks, and I have sometimes found that I've bought a PDF on DriveThru and then later bought the hard copies directly from the publisher, to have the publisher then provide access to a pdf through a code or link. In many cases I have not bought the rulebooks until after I have the PDF and accept that this is the way of things, but as an industry there may need to be more consistency in this. For many customers, PDFs can be a gateway for purchasing whole set of physical copies from a range so it makes good business...See more sense to create deals where the customer isn't alienated by high price duplicate purchases of the same content. Side note to this may also include an acknowledgement to customers in the past who want to support a publisher of their favourite hobby and community but have become frustrated or wary of new rule editions by all publishers - hence discussion posts below regarding "I'd rather play 1st ed." -which is totally valid because many of your customers may be returning to the hobby or collectors of past and present, since you are in fact selling new art and hopefully genuinely new content which is good. I think my point is, when we step away from the endless promises of kickstarters, new but old stuff for more money in a different format, may even upset legacy gamers, who I'm guessing are a big part of your market. There simply has to be better ways of not taking the money multiple times from the same customers for the same thing - one way, is to be upfront and say, "okay, wait and buy the rulebook direct from us and then we'll send you the files". This PDF has the option of turning off the background layers, making it more printer friendly. Excellent, I look forward to acknowledging your 'purchaser' status, your review (after you've read all 666 pages, snatchurally) and the URL of the blog/podcast/youtube channel that you'll be posting the progress of the campaign on. Oh, and while I am pretty boring, I'm not totes boring, according to my kids. A 666 page campaign to go with a 488 page rulebook? I appreciate the effort guys but sometimes less is more, I think I'll stick with 2nd ed. Cripes dude, why did you even post? Because sometimes, dood, old neckbeard lives matter. It's a very odd complaint, not just for the troll-factor of writing comments on a product you have not actually read, but also because one of the strengths of the Masks design from 1st edition onwards was it's propensity towards expansion with add scenarios and locations. The Masks of Nyalathotep Companion that was released to expand the original had about 700+ pages of original material in itself. This new edition adds art, aditional chapters and lends even more weight to what was already an epic campaign. Your criticism seems to be unappreciative of the core strength of this product. And yes, I have purchased this product through the Chaosium site - largely because it adds a discount to the physical product which will be available later. In 2017 I ran Shadows of Yog-Sothoth, 1982 edition. In the calendar year that we played, twice a month, my group managed five of the seven scenarios. That's 41 pages of material that we thoroughly enjoyed. In 2018 we took a break from CoC to play D&D (BX), Cyberpunk 2020, RuneQuest (2nd Edition) and Marvel Heroes (TSR). In 2019 we'll return to Shadows to finish remaining two scenarios of the campaign and probably play the two bonus scenarios as well. That may well take us most of the year, and that will be alright. We will most likely have got 2 years play out of one 72 page campaign book using a 96 page ruleset and will think ourselves very well served by 35 year old product that is considered to have no value to the market. We, and by we I very specifically mean my friends and I, don't need a 600+ page campaign book. We also don't need a 500- page rulebook to run a game we've been playing for over 30 years. Is it pretty? Undoubtedly. Was it written with love? I think so. I regularly listen to The Good Friends...See more and they largely seem like a nice trio of guys. Is it necessary? No, not in my opinion. I would love it is Chaosium give an earlier edition of Cthulhu the same treatment they gave 2nd edition RuneQuest a coupe of years ago, but that seem unlikely in todays marketplace. Chaosium have decided, for better or worse, that their interests lie in producing prestige product at a premium price, and that's fine. But it's not for me. If you feel inclined to spend $130 on a campaign that's great, the company will probably use the money to make something that does appeal to me down the line. Moar is bettah in this 1, trust me! Superb in all respects. I don't think it's an odd complaint, and I don't think it's trolling. The point is that the REASON he hasn't read/purchased it is BECAUSE it's too long - and that he would be keen to try a version of more reasonable length. I feel the same way. Actually, I still play 1st edition (from 1981), and have the original MoN from 1984, but this new release looks good. I will buy it, and read it, and I suggest you give it a try as well before dismissing it in public simply on the basis of page count. Oh, and I also have the original SoYS from 1982, and would recommend MoN (any edition) over that - too much of it is on rails, although some of the scenarios (Devil's Canyon) are admittedly top class. It is. And considering the nature of the complaint being about the time it may take to read or run, it is equally odd that he is spending such an inordinate amount of time complaining about it on this forum. He hasn't bought it, read it or run it. He has no obligation to. So why bother complaining about it? You aren't really taking into account that the new episodes are all optional. So, as a Keeper, you have control. As far as I can tell, they haven't added that much to the core campaign, rather, they've enhanced it. It was a quick and simple way to let the publishers know not all of their fans want mega-product. It's all optional, I choose the option not to pay 45 quid for a 666 pdf but pay half that for the original campaign on ebay. You'd be very lucky to get an copy of the original box set at all on eBay, let alone for anything like half the price. You could get one of the later editions (say the 3rd printing). It would have about a third of the page count for sure - but also be second hand, minus the art, maps and other resources made available in the new edition, based on an older version of the rules, in black and white print with a smaller font - all for anything between $20 to a $100 or so? I think most purchasers will know where their money has gone in to with the new edition. Your stance, as a non-purchaser, makes little contribution to anyone seeking real information about a potential purchase. If you wanted to let Chaosium be aware of your frankly feeble point, then you could have just sent them an email. I was, cheers, and I look forward to reveling in it's black and white small font goodness, crafted for the version of the rules that I actually play. I'm (kinda?) sorry my offhand comment appears to have upset you so much but visiting DTRPG is part of my daily morning routine and that was more convenient for me. You think my point 'feeble'? No problem, I find you response facile. Not just a single offhand comment, though, eh? To reiterate - you neither own, or have read or have run this product. Your single objection is to the page count of an updated edition being larger than the original. You could certainly add 'facile' to 'feeble' in describing this criticism. Okay, lets break it down. One comment made at noon (lunchtime at work) on the 2nd July. That would have been all she wrote if Colin hadn’t decided to pose his question, which DriveThru duly notified me of via the power of a little red ‘1’ on my ‘Account’ tab the next morning. The only reason that little red ‘1’ was there was because Colin had replied directly to my comment, unlike Casey, who just posted his (totally boring) opinion of me, not the product, by adding a comment, not replying to mine. Of course, I’m going to look, and off course I’m going to reply to a comment directed at me. Two days later you wade in, characterise my comment that the product is too long for my utilitarian tastes as ‘odd’ and then label me a troll. For reasons onlyknown to you. I then take the time to contextualise my attitude and explain why I don’t need over a 1,000 pages of rules and scenarios to run a classic CoC campaign. But the little red ‘1’s keep appearing as people keep responding, so of course I’m going to keep checking what’s being said, as much about me, as the product. I choose not to purchase a 600+ page pdf because I have no interest in engaging with something that bloated. When I run Masks I want to run Masks as was, not the Special Edition Digitally Enhanced Extended Cut with scenes that weren’t previously deleted because they weren’t there in the first sodding place. I don’t mind that you do, why does it bother you so much that I don’t? Check back again if you like: your commentary has no valid reason to be here, and you ARE a troll. I too have to question why Tony would make such comments on a product he has never read and says he would never intentend buying. I have found his responses somewhat vitriol, retrograde and unnessesary. Any iteration of a product (especially one with such a pedigree as MoN) is bound to bring improvments due to a number of factors; artwork, typface, print quality, paper, handouts, corrections to typos or errors, improvments to storyline (terror australis was an addition to the MoN 1st addition). Should a good product be preserved in aspic, I say no. I for one do not miss the poor quality print and paper of the earlier Chaosium products and welcome the pdf's so we can print the handouts rather than ruining the ordiginal products or making do with crap photocopies. Its a bit like watch a TV programme you don't like, don't moan just change channels and be happy. Good lord people. He made a comment about a gaming product. He didn't insult your mother or kick your dog. If he doesn't want it he's free not only to not buy it, but also to say so, just as you are free to post squeals of excitement if you feel so inclined. I would hazard to guess that had he posted something to the effect of, "Squee! So can't wait to try this!" then nobody would be asking him why he "bothered to post." Sometimes I'm really embarrassed to say that I tabletop game, because toxic reactions like this give the community a bad image. He can take a pass on this product, and freely express his reasons why. You can buy both the PDF and the print and extol their virtues. Butter your bread side up, or side down. The world will march onward blissfully ignorant of your differing, and completely compatible, opinions. But practicing civility? That matters. So if we all spent our time commenting negatively online on products we have no intention of purchasing and haven't read, but other people might like and are interested in recieving informed ideas about, then the world would be a much more practically civil place? Maybe. @ Rory - I refer the honourable gentleman to the answer I gave some moments ago. For the record I'm actually quite fond of Chaosium and am glad the CoC 7th ed kickstarter didn't kill them stone dead. I am also very happy that Greg and Sandy are at least involved in the company again. But I'm not really a fan of mega books, not matter how much 'sans-detour' artwork they jam into them. Tony M, Thank you for your comments. I am glad you are happy that Greg and Sandy are now involved with Chaosium again, as am I. They are good guys who put out quality product and have done so for decades. I first met Greg in 1985. That said, I think you may wish to consider what you post here since Greg and Sandy, and the rest of Chaosium, are almost certain to come here to gauge the response to their latest reworking of this campaign. Why would they not? This is the largest vendor for RPG pdfs. I would anticipate they will be disappointed to read so many negative posts from someone who has not even read the release. They will also probably be upset that your posts may make it difficult for others to come here and find constructive information. Hi Gareth, you're very welcome, but it would help if you contextualised your interest in this. Chaosium employee, DTRPG employee, or just a simple DTRPG customer like myself? I've never met Sandy but I did meet Greg briefly in the 1990s, and I have to say I'm very doubtful my opinion would bother him in the least. And given what Sandy has weathered through the Cthulhu Wars odyssey I doubt this would raise more than a twinkling smile. I don't know what it means but it does strike me as interesting that the discussion has 20+ comments but as of writing this the product hasn't received a single review, good or bad. This title was added to our catalog on June 30, 2018.